I'm sure I don't need to tell you who the adorable child is whose face you just clicked on. But if you hadn't guessed, it's none other than the man himself. Suffice to say, this picture graced my doorstep Tuesday night 10/12/00 in the form of a magazine Valerie bought on Ebay. It is called "The Star Hits 1987 Year Book." It is chock full of lovely pics of the "famous" from 87. 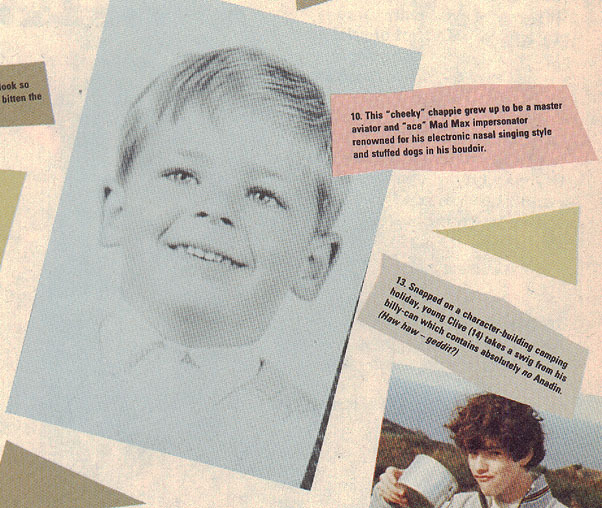 In said mag there are two pages dedicated to, "You must have been a beautiful baby, HEM HEM." Well there are pix with the likes of Ozzy and Pete Burns... But when Valerie pointed to the picture above and asked whom it was, I knew right away and I thought I would share with the masses.